* Julie Andrews is my favorite celebrity of all-time. 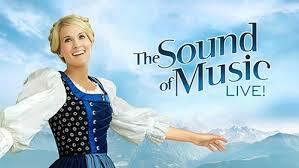 * Sound of Music is one of my favorite movies of all-time. * I have never seen the Broadway version of TSOM, only the movie. * I’ve had some cocktails. – Everyone should be thanking their lucky stars that Audra McDonald is a part of this. – What a great set! So much more real looking than the Austrian Alps! NOT! I’ve seen better shrubbery in my yard, and I have the deadest, most uncared-for shrubbery in the city. – Carrie Underwood just almost biffed it on the hill! What if she tripped and fell in the first 5 minutes, during the most important song of the entire show?!?? I wonder if her understudy, Kellie Pickler, would have to take over.